It has been AGES since I have done a product review and so I thought ooo I have been using my No 7 day cream for a while so I would let all you guys in on what its been doing for me. 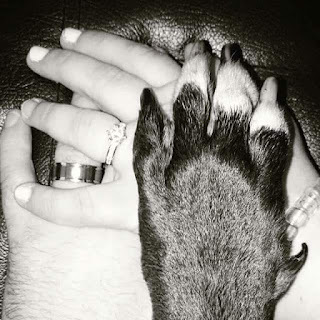 For all of you who have followed my blog from the beginning you know I am a bit of a brand follower. I will find a brand and if I love it I will buy everything, but and here is the shocker, I am a trying to get out of this routine. The moisturiser I have always used has been my Nivea Daily essentials day cream for normal/combination skin. It really had been part of my routine since finding the brand when I was 18, oh gosh nearly 10 years. I decided I needed a change when the skin on my t zone started to become very flaky even after moisturising. So when I went into boots one day to top up on my foundation I found a new one. I spoke to the girl at the No 7 counter in Boots and told her about the problem I had been having, I originally thought it had been the change of foundation from L'oreal to No 7, but she asked about my skin routine and when I told her what I did she said maybe change my moisturiser and see how my skin went and to tell you the truth I am so glad I did. 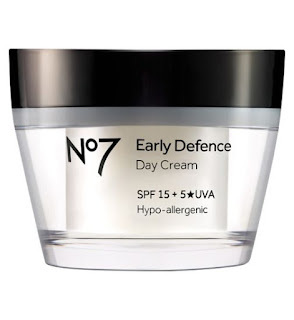 The one she recommended is the No 7 Early Defence Day Cream, as well as moisturising the skin it also has SPF 15 and helps to protect against UV as well as help the skin look younger for longer. At first I thought ok she is trying to get a sale out of me, but I thought what can I loose, if it doesn't work I can change it and go for something else. If you want to check this out you can see it here for no 7 products. The first couple of days I couldn't really see a difference but after the first week my skin was no longer flaking. I also find it is easy to pop on when I have those days when I don't really want to wear make up. It feels very nice on the skin and even though the pot is small it has lasted for AGES, I bought it in the beginning of November and it has only just got a quarter of the way through. For me this is my little miracle cream because of how nice my skin feels and I do love it. What do you guys think? Have you tried this? Do you recommend any other No 7 products? I will keep you all updated with how my skin carries on.